Today's forecast features a number of updates to the 'polls plus' model: namely a full account of where the Greens and UKIP are exiting in seats where they fought in 2015, and where incumbent MPs from 2015 are standing down. For full information on the effects that this information has on the model, see the methodology page of this website. 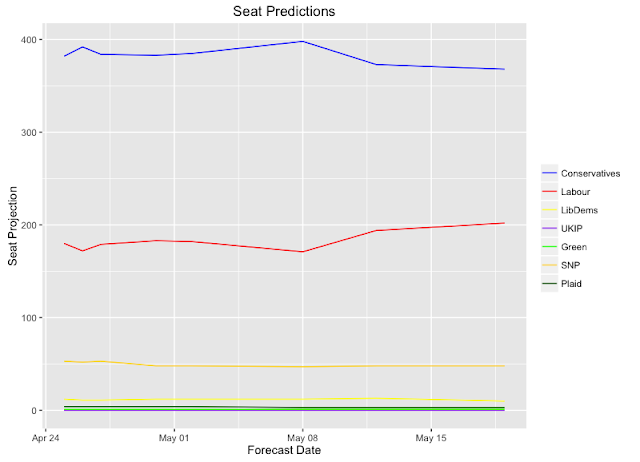 It has been a week since the last PME Politics forecast, when the projected Conservative majority dipped under 100 for the first time since the forecast was launched. 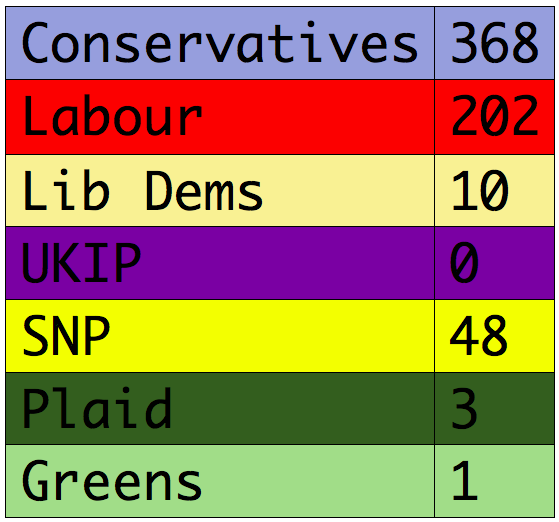 Today, the seat projections move in further to give the Conservatives a majority of 86. The continuing slide of the predicted Conservative majority is important - if this trend continues, we should soon abandon talk of a Conservative landslide (at least in terms of seats). Over the past week, more polls than not have given Labour a positive swing compared to their 2015 vote share. In other words, in most of this week's polls voting intention for Jeremy Corbyn's Labour has surpassed Ed Miliband's 2015 result. 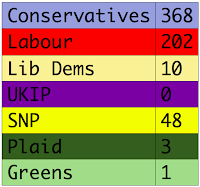 As such, the Uniform Swing (UNS) model, using the updated 7 day rolling average of Westminster voting intention polls, looks much better than previous for the Labour Party, and gives the following result: Conservatives 370, Labour 198, Lib Dems 5, UKIP 0, SNP 55, Plaid 3, Greens 1. For the first time the UNS model has Labour close to the McCluskey 'good night' benchmark of 200 seats, reflecting the recent narrowing of the Conservative lead in the polls (though this narrowing is incredibly relative - even the closest polls still have Labour 15 points behind the Conservatives). 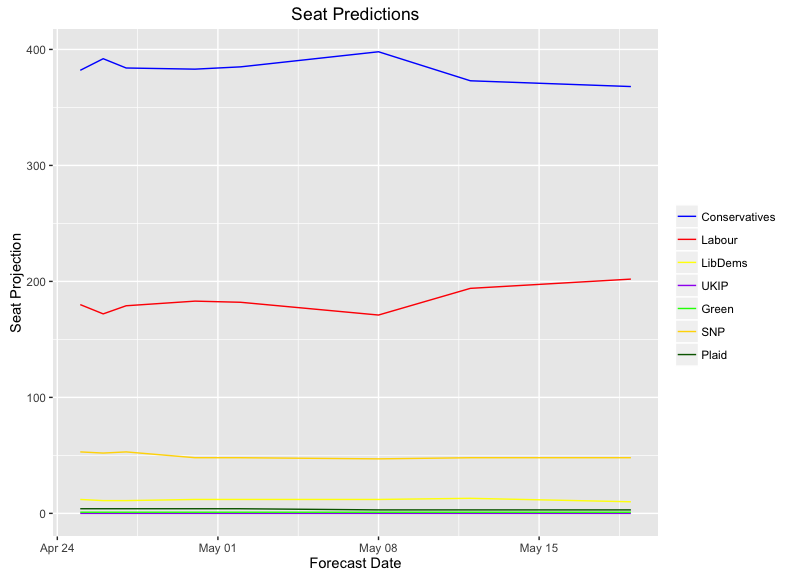 The 'polls plus' model does actually take Labour over the 200 mark for the first time in this forecast. The added contextual factors within the model suggest that just a few more Labour MPs will hang on in the face of the 'blue tide' than in the UNS scenario. The Lib Dems move perilously close to single figures in today's forecast, currently predicted to be only 2 seats better off than their disastrous 2015 result. Despite Labour's improvement in the polls, the Conservatives continue to enjoy voting intention shares of close to 50%, thus maintaining a clear - if decreasing - lead in projected seats. 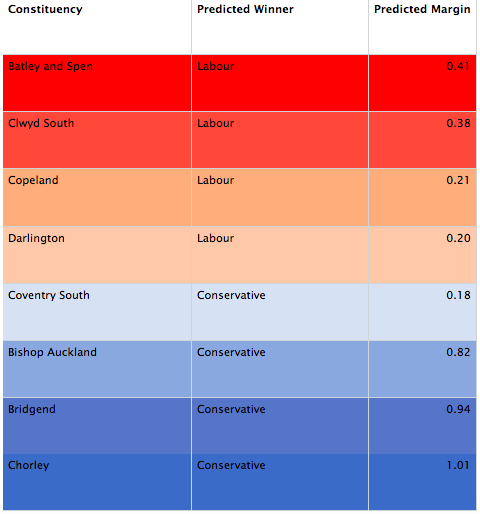 Finally, the 'polls plus' model predicts that the margin between Conservative and Labour seat wins now sits between Darlington and Coventry South. Interestingly, Copeland - taken by the Conservatives in that famous by-election earlier this year - is also close to the projected fault line between the country's two largest parties. If Copeland were to fall the other way and once again return Trudy Harrison to Parliament, it would be no mean feat given past results in the seat at General Election time. Copeland's precarious position should serve as a reminder to jut how many traditionally solidly Labour seats still remain in jeopardy - polling rise or no.